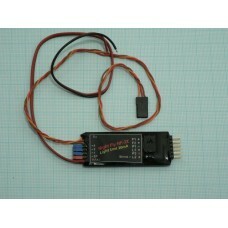 Medium size controller for 0,8 m - 1,3 m wingspan. Outputs for 20/L2 = 80 mA LEDs: 2x Position / 2x Flashing / 1x Landing. Power 6 V-14 V. 2p3p control. 8 Flashes variants. You can order a separate unit or together with the LEDs and cables as a set. The unit offers eight different flashing combinations ( 0 -7 ) with one second period for F1 and F2 outputs. See the diagram on the left side. One of those combinations can be selected by couplers (jumpers) 1, 2, 4. The sum of numbers of the connected couplers represents the number of the selected combination. The unit can be used as controlled or non-controlled by pilot. If controlled by pilot, the jumper "3p" allows you to select between 2-positions (Fly/Landing) or 3-positions (Off/Fly/Landing) control by the remote controller. With a 2-positions control the position and anti-collision lights start work when the unit is connected to the accumulator. However, the landing lights can be switched on and off by pilot. In the 3-positions control system, all lights are off in the off-position. In the fly-position the position and anti-collision lights are on and in the landing-position, all lights are on. Unit is in non-controlled mode if the Rx cable is not connected to the receiver. In this case the lights start work when the unit is connected to the accumulator and the "3p" jumper can be used to switch manually the landing lights off. Anti-collision and landing lights automatically begin to flash when the plane is unable to receive a signal from the remote controller. The receiver circuit and the light circuits are electrically separated by an opto-coupler. Unit is compatible with Graupner or Hitec-type connectors. The outputs maintain the nominal current in the wide range of voltage from 6V* to 14V without the need to connect compensating resistance series in the circuit. The stabilization starts working from 4.5V, therefore it is possible to connect the unit with the used NiCd or NiMH batteries with 5 up to 10 cells or Li-Pol from 2 up to 3 cells. As the number of the cells of the powering accumulator increases, so does the number of diodes that can be connected (serially) in one circuit. NOTE *: The unit contains protection against reversal polarity connection to a power supply. It can be ordered also without this protection circuit, as so called "low voltage version" (4,8V - 6V) . In this case the unit works also in connection with 4-cells NiCd or NiMh accumulator but the reversal on input voltage can destroy it. So be carefull and use a connector with protection lock when working with "low voltage version".